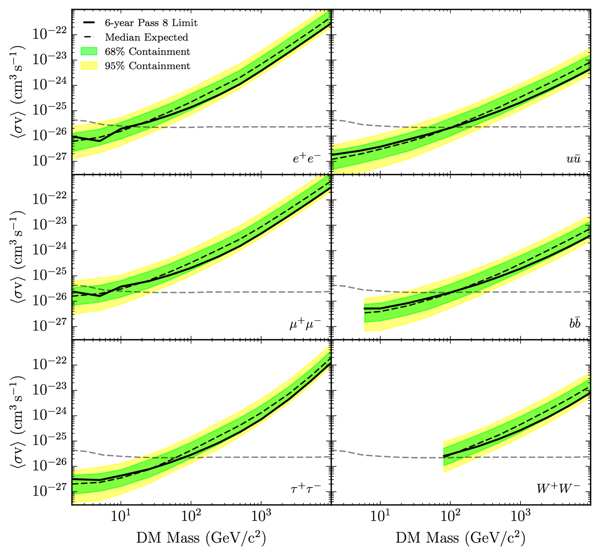 Cosmological observations indicate that a large amount of invisible, non-baryonic matter (dark matter) may comprise most of the matter in the Universe. However, its fundamental properties remain a mystery searches using particle accelerators have failed to detect this weakly-interacting material. 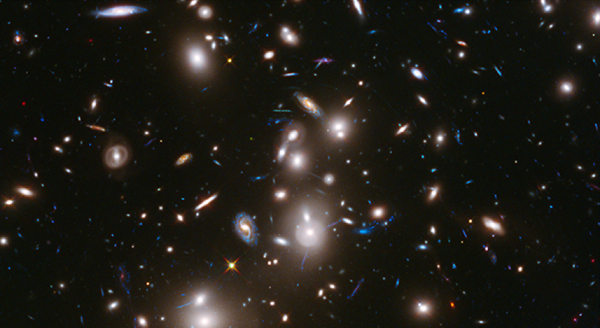 As such, the nature of dark matter remains one of the most important puzzles in modern science. Theorists have speculated that the strong gravitational effects caused by the presence of dark matter may mean these particles are very massive. If so, their self-annihilation would likely result in a signature visible in the gamma-ray regime. 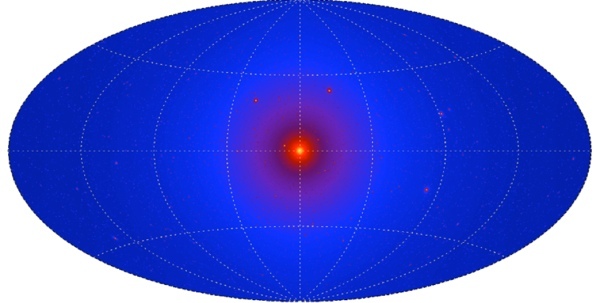 An Excess At The Galactic Center? 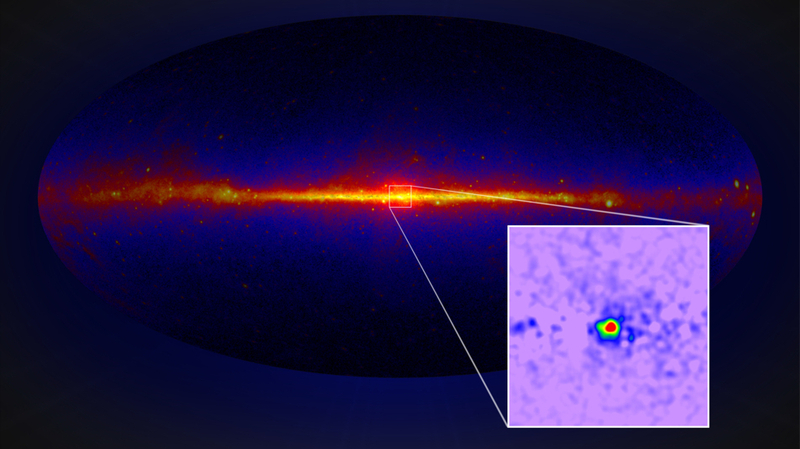 The Galactic Center is predicted to be the closest, brightest source of gamma rays from dark matter annihilation. Analysis of the halo of the Galactic Center with Fermi-LAT (subtracting the diffuse emission from the region) by gamma-ray researchers has revealed a GeV excess near the Galactic Center. This excess has an energy spectrum that peaks at several GeV and is approximately spherically symmetric. 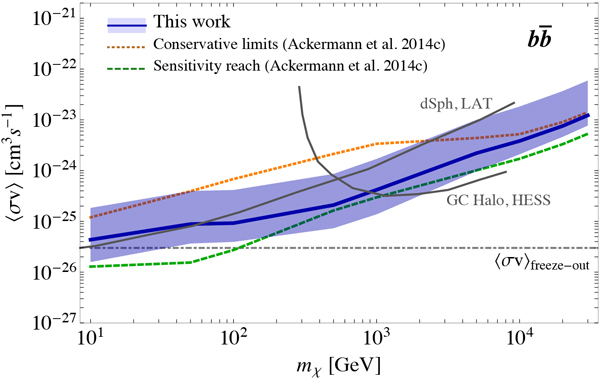 Both of these features are consistent with expectations from a dark matter signal from the Galactic Center. While tantalizing, it is possible that this signal is instead due to conventional astrophysics (such as a population of millisecond pulsars) or an incomplete understanding of the subtracted background in the region. Additionally, a GeV excess at the Galactic Center with the observed properties is in tension with non-detections made of other dark matter targets (such as dwarf spheroidal galaxies). Future observations of both the Galactic Center region, as well as of dSphs, may provide additional information about the source of this excess. The hunt for dark matter continues with Fermi-LAT across a wide variety of astrophysical sources. 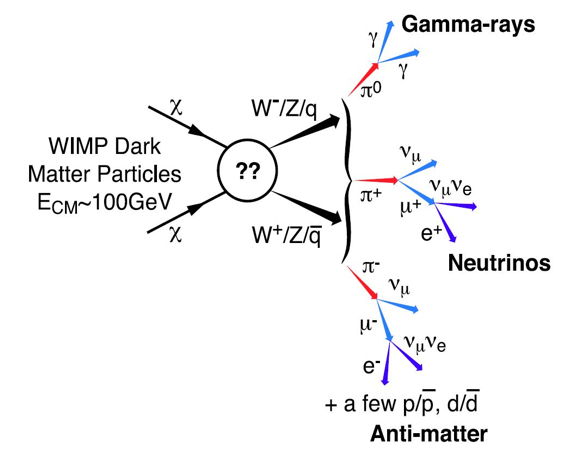 Here are some additional targets used by Fermi-LAT scientists to search for the elusive gamma-ray signal indicative of the presence of particle dark matter.